Battle through our returning seasonal events! 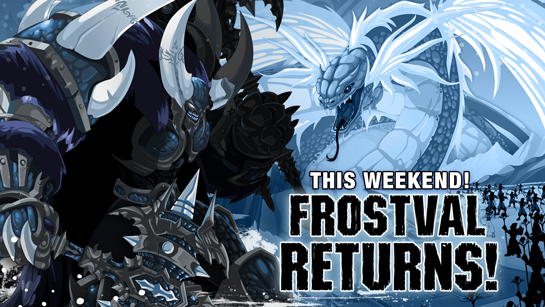 Frostval is a time of joy, hope, and... defending Lore from all the insane ice monsters that cannot stop attacking it?!?! Log in this weekend to battle through all our winter holiday events and unlock seasonal rewards! * Giefury's name comes from the Old English noun "giefu" for "a giving, gift", which is related to the Old Norse word "gift, gipt" meaning "gift; good luck." ALL of the seasonal events from previous years will also return - that means you'll get to battle Kezeroth, Quetzal, and more... PLUS get all the holiday seasonal goodies that come with them! That's all leading up to NEXT WEEK's ALL NEW FROSTVAL ADVENTURE (where we meet an ancient horror with an elder-god sized hunger). You are welcome to all of the great Frostval seasonal rares and the heart-warming Frostval stories. With 9 years of Frostval events, Quibble's Shop, and the Collection chest to bring tonight, we've had to shift the clock ahead one week - the Immortal Chronomancer Class and armor set will release in Battleon town next Friday, along with the next Quibble shop update and our new 2017 Frostval event.